Lee Fisher is the Dean Designate at Cleveland State University’s Cleveland-Marshall College of Law. He served as Interim Dean from June 2016 to May 2017, and on July 1, 2017, he becomes Dean and Joseph C. Hostetler-BakerHostetler Chair in Law. Lee Fisher’s diverse career has spanned the private, public, nonprofit, and academic sectors. In addition to serving as Dean Designate, Lee is a Senior Fellow, Cleveland State University’s Levin College of Urban Affairs; an Urban Scholar, College of Urban Planning and Public Affairs and the Great Cities Institute, University of Illinois at Chicago; and Senior Advisor to CEOs for Cities, a nationwide innovation network for city success. Lee clerked for Judge Paul C. Weick of the U.S Court of Appeals for the 6th Circuit. He has decades of experience in legal practice, most extensively with Cleveland-based Hahn Loeser as Of Counsel from 1978-1990 and Partner from 1995-1999. He served as Ohio Attorney General and was the first Ohio Attorney General to personally argue cases before the Ohio Supreme Court and the U.S. Court of Appeals for the 6th Circuit. In addition to serving as Attorney General, Lee has served as Ohio Lt. Governor; Director, Ohio Department of Development; Chair, Ohio Third Frontier Commission; State Senator; and State Representative. He also served as President and CEO of the Centers for Families and Children and President and CEO of CEOs for Cities. Lee is a graduate of Oberlin College and served on the Oberlin College Board of Trustees for 12 years. 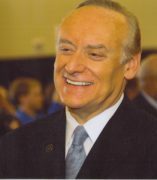 He earned his law degree from Case Western Reserve University School of Law; he was the first recipient of the School of Law’s Distinguished Recent Graduate Award and was inducted in the School of Law’s Society of Benchers. He also earned his Master of Nonprofit Organization from the CWRU Mandel Center for Nonprofit Organizations. Lee is married to Peggy Zone Fisher, President and CEO of the Diversity Center for Northeast Ohio. They have two children, Jason, an actor in Los Angeles, and Jessica, a junior at Cleveland State University.